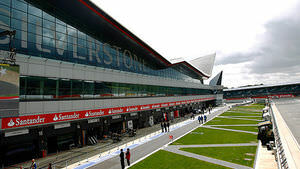 Two weeks on from the fresh racing in Austria, Formula One heads to the heart of motorsport valley in the UK, bringing the 2014 season to Silverstone. With a handful of drivers and teams celebrating their home races this weekend, expect there to be plenty of PR activity, lots of talking about the on and off track antics, and some great photography along the way. If you want to keep on top of all that occurs over the British Grand Prix weekend, stay tuned to this page which will update with everything you need to know to enjoy round nine of the season. Hello F1 fans and welcome to a brand new weekend of Formula One. We're bringing you all the need to know facts and figures from the next few days at Silverstone. Most of the teams are heading into this race far more relaxed than on other occasions, due to the proximity of factories to track. Marussia were happy to release their cars at the last minute to head to the circuit, whilst Force India are quite literally just across the road from Silverstone. Caterham aren't too far down the road, but have their own problems to deal with - team boss Tony Fernandes confirmed today that he's sold up to a consortium of investors. The main change at this point is team principal Cyril Abiteboul stepping back (reportedly to Renault Sport again), and former driver Christijan Albers stepping in the top role. Meanwhile, Jenson Button celebrates his home race this weekend, and is hoping to turn the circuit completely pink in memory of his father. Keep your eyes peeled and see how many you can spot over the weekend. For weather, times and dates, track and tyre information, the handy race preview thread will give you all you need to know. Ahead of their cross country trip to Silverstone, the Caterham team have been sharing a set of photographs documenting race preparations at Leafield. Romain Grosjean spent his pre-race Wednesday wisely, hanging out with Raymond Blanc at the Le Manoir aux Quat' Saisons restaurant, an eatery so upmarket it provides a helipad for visiting guests. One cookery lesson later and the Lotus driver rustled up a tasty salmon tartar something-or-other, a favourite dish of partner Ms. Jollès. 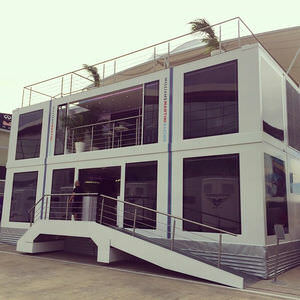 Sporting looks so sharp you could cut yourself, the Williams team have unveiled an all new motorhome in the Silverstone paddock this morning. Susie Wolff will take part in her first F1 race weekend tomorrow, so this morning she joined Williams regulars Bottas and Massa, plus various team personnel for a walk around the lengthy Northamptonshire asphalt . Silverstone opened its gates to fans a day early this year. The pitlane and main straight are open to any attendees carrying a three day ticket to the British Grand Prix, while Sky Sports plan to record a live edition of 'The F1 Show' for ticket holders from 18:00. Kaiser Chiefs are on hand to entertain the crowd this evening, today's gig marking the start of their UK summer tour. Other venues on the calendar have long offered fans a four-day F1 experience. Organisers claim Thursday access has been offered to celebrate the 50th running of the GP at the venue, but perhaps the idea will be successful enough to repeat in future years. It is all change at Renault Sport down in France. The motorsport division of Renault have announced the retirement of company president and managing director Jean-Michel Jalinier. Stepping into his rather large shoes will be Jérôme Stoll who will also continue as chief performance officer and as group sales and marketing director. 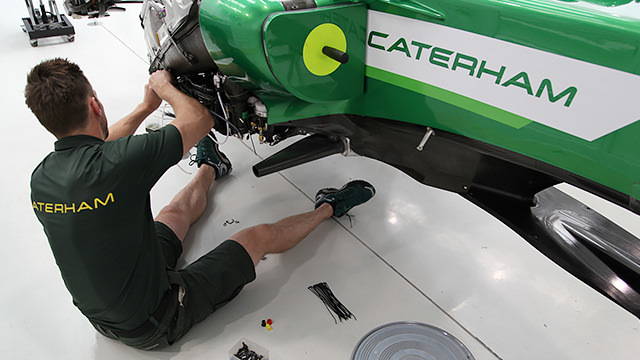 Cyril Abiteboul, who was dropped by Caterham F1 yesterday returns to his previous employers and will take up the role of managing director, reporting to Stoll. Following the unceremonious dumping of team principal Martin Whitmarsh earlier this year, McLaren have been busy reshuffling their operation under the watchful eye of Ron Dennis. One loose end still left to tidy up is the future of Jenson Button. The 34 year old Brit, originally recruited by Whitmarsh, has a contract only until the end of the season. This week Dennis piled on the pressure by telling Sky Sports he thought JB should be trying harder. "I’m sure Kevin is giving a big wake-up call to Jenson. Do I want him to try harder? Of course I do. He’s a highly-paid Grand Prix driver. We are not giving him the best car and yes, it would be challenging for him to win in this car, but he could do his bit and Kevin has to make it as difficult for him as possible." In an interview with Ian Parkes of the Independent today, Jenson claims he's not concerned about his future and is confident he'll be driving for McLaren next season. "It's not necessary to talk about it right now because we've other things to focus on, like making the car quicker. So we haven't spoken about it, and it's not something I've pushed for." It is worth keeping in mind that Button's contract for this year wasn't officially agreed until October of last year. A couple of interesting snippets from the press conference today include Lewis Hamilton praising Pirelli for their tyre choices so far (or perhaps subconsciously dwelling on what happened here last season). "Pirelli have done quite a good job this year. We haven’t had any tyre blow-outs, which is a real positive for us, it’s what we wanted. You can’t always get it perfect, so whether or not they’ve gone a little bit too far in that direction, we can decide perhaps at the end of the year. I’m sure they’ll alter it again for next year. Of course we always want more grip, so every time they get softer, that’s a good thing for us." Felipe Massa talked of celebrating his 200th grand prix as well (there had better be cake): "It’s really a great feeling to have 200 races, in a great team, Williams-Martini home grand prix as well, at a great track, fantastic fans. So I hope we can have a very strong race, like we had in Austria. I hope we carry on fighting competitively." Talking of cake, Massa hasn't delivered yet but the Red Bull team have done the double. With Ricciardo and Vettel both celebrating birthdays this week, the boys were presented with some epic cakes. According to Paul Weaver of the The Guardian, the owners of F1 CVC Capital Partners have had enough of Bernie Ecclestone and are considering a future without him. That said, the most amazing revelation (to us at least) reading that story is the insight that Formula 1 is a billion dollar business that operates without a marketing department. Today was Susie's Big Day but unfortunately for everyone involved, it ended disappointingly early. The first practice session saw Susie Wolff head out in Bottas' Williams car, but only manage four laps before the engine conked out. More reaction to this can be read alongside this gorgeous big picture. Meanwhile, Williams weren't the only team having reliability troubles - although they did suffer more than their fair share today. It seems as though the cars are really struggling at this point in the season, either due to the conditions of the recent circuits or simply the age of the components. Find out who else struggled in both practice sessions today with this sixty second roundup. Rosberg pipped his teammate to the fastest time in the first practice session, although Hamilton wasn't too far behind. The Mercedes pair were chased by Ferrari, who were looking slightly more competitive today, albeit because Williams and others were down and out. Hamilton was fastest by the end of the day but missed out on the opportunity to do long run practice after his Mercedes stopped out on track. He should know Silverstone pretty well by now, but missing out on some crucial track time could prove costly as the weekend unfolds. Full results for both sessions can be viewed on the site: FP1 here and FP2 right here. "While 18-inch tyres would be a big step for Formula One, there are many other motorsport series that already use this size. So there’s scope to go even bigger than that in Formula One in years to come. In order to underline F1’s role as a test bed for future mobility solutions, we believe that it benefits everybody to have as close a link between road car tyres and competition tyres as possible: a belief we have held ever since we introduced the low profile tyre from competition to road use back in the 1970s." It seems unlikely this will happen anytime soon, but keep an eye on Pirelli's progress as F1 continues to develop and keep up with the outside world. If you thought you'd heard the end of any fuel-flow problems, well, actually you may now have. The FIA have introduced new sensors for the Silverstone weekend which should stop any of the issues seen previously in the year. Race Director Charlie Whiting says: "We hope [this] will overcome the offset problem which we think is being caused by cold fuel being put into the car – specifically in qualifying where the car comes in and they add fuel that changes the temperature considerably. Hopefully the firmware should resolve that problem." "Further to the discussion in the drivers meeting yesterday evening, I would like to remind all teams and drivers that we will adopt a "zero tolerance" approach to cars leaving the track at the exit of turns 8 and 18 during qualifying." A very damp final practice session ahead of qualifying saw limited running. Full results available here. Nico Rosberg takes pole position for the British Grand Prix, a result which belies an incredible qualifying session. That's Jenson Button there, taking third place, and Nico Hülkenberg will line up on the second row of the grid. If you want to read the full story of what happened - because you'll never believe it if I just summarise it here - then these highlights are for you. F1Minute did, of course, attempt to recap the session in as brief a way as possible. If you've only got sixty seconds, this should get you up to speed. If you just want to pore over the finishing positions and ponder at the performance of Ferrari and Williams, full results are available here. It was a jam-packed race, except for that one hour of red flag. Poor Kimi Räikkönen had a huge crash that left him out of the race and left the guard railings needing some extensive repairs. If you missed any of the action or want a reminder of what occurred, the Factbyte Factbox highlights covered pre-race, during the red flag period, and all the action that followed the restart too. The end result was something of a surprise, although it was a Mercedes that took victory. The reliability woes headed to Nico Rosberg's side of the garage, whilst the Williams team had hugely mixed fortune - a first lap crash versus second on the podium. Full results here. The standings tables are one of my favourite parts of the post-race analysis. Here, although Mercedes are scarily far ahead of everyone else, the battle between them is captivating. 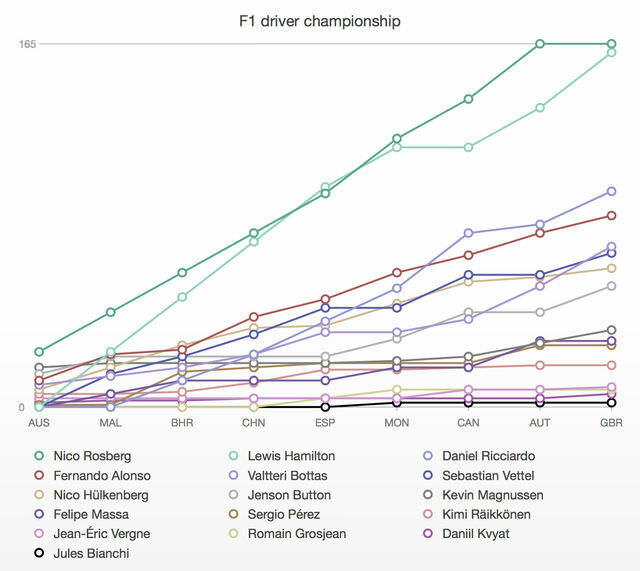 Also note Bottas' recent rise through the field. Full driver standings are available to view here, whilst the constructor's championship is also worth a look. Final link for you from our own round-up, and that's Rate the Race. Have your say on how the British Grand Prix compares to the rest of the 2014 season, and pick out your driver of the day from a selection of great performances. "Kimi is OK. We checked several times and we will take a decision about the test, and what to do with the test, so we see after today. I want to be 100 per cent sure that he will be fine but there is no major issue at the moment." You'd think that winning his home race would be enough for Lewis Hamilton, but the Brit has revealed he would have rather fought his teammate to the line for the win than take victory the way he did. "I was gutted not to have a wheel-to-wheel race. I went to the prime tyre and he was on the options and yet I was catching him at the time. I knew then that at the end of the race on the option tyre I was going to be in a position to fight to him and I was so excited for that. "I don’t want anything bad for my team-mate. I want him to be at his best and me to be at my best so we can really see the difference." Hamilton also hit out at the trophy, a new design, which broke within about a minute of him holding it. The trophies were some kind of red wobbling material that didn't look all that sturdy. However, Santander have advised: "The trophy comes from a student who won a competition done worlwide. This was the only way to do it, because it was not our design. We will try to improve in future challenges. Tomorrow we will send the press release. We were not allowed to do it earlier." If you don't have time to watch a replay of the race, or read through our handy highlights, then I recommend this brief sixty second round-up. It's hard to shrink a race like that down, but it's got the key need-to-know facts in bitesize form. Daniel Ricciardo's third place marks his fourth podium finish of the season. Whilst not quite the win he experienced in Canada, the Australian is still happy with the result, particularly after an unexpected strategy paid off. "The one stop wasn't planned. We pitted quite early on the Prime because we were quite slow and it wasn't working, so we came in for the Option and, at one point, my engineer pretty much said alright four laps to go on this tyre then let's box. I said the pace seems OK, the tyres aren't getting any worse and let's try and stay out or at least think about keeping me out there and he said OK we'll look at our options. Then, a few laps later he said do you think you can go to the end, there's 15 or 20 laps to go, and I said, at the moment I think we can give it a crack. And so, yeah, we did and it paid off!" Räikkönen's incident wasn't the only scary moment we saw during the race. Esteban Gutiérrez turned in on Pastor Maldonado and tipped the Lotus up into the air. The Sauber driver has been given a three place grid drop for the next race in Germany, after the stewards found him to be the guilty party. Their finding says: "Having viewed all the video available and having heard from the drivers, the Stewards determined that the Driver of Car 21 was predominantly at fault, causing a collision at Turn 16 between him and the Driver of Car 13." The repercussions of Räikkönen's accident continue as Ferrari reveal they will let the Finn sit out Silverstone testing this week, instead bringing back their test driver Jules Bianchi from Marussia for some duties. Pedro de la Rosa will also be getting some seat time. Adam's excellent post-race driver of the day thoughts are now up and ready for your perusal. Head on over for thoughts on Valtteri Bottas, Lewis Hamilton, Fernando Alonso and more. Felipe Massa is concerned about the pace, or lack of it, of Mercedes' formation laps. The Williams driver had a terrible start off the grid at the weekend, and pins it on soaring temperatures. "The FIA say we can't go so slow but they didn't do anything or penalise anyone. I think if they penalise one car for that by giving them a five grid penalty for the next race, everything will change. I stopped two times, I pulled the clutch and I was waiting because it was so slow. It was so slow we couldn't do burnouts. You cannot go slow just because you want to. For sure they do it on purpose and they have done it for most of the races, so they are doing it for a reason." Just before we go, a selection of notes and highlights from the weekend, in the Silverstone edition of Pick and mix. Read on for trophy talk, pink ponderings and celebratory concerns. That about wraps up our coverage of the British Grand Prix weekend. It's been an absolute blast, a great race, and some interesting fallout to mull over while we wait the two weeks until Germany. Stay tuned to Sidepodcast to stay up to date with all the F1 news and views, and join me back here again in just over a week for the build up to Hockenheim!